“You are looking for Sverri? Down there, that’s his house. Park your car in my driveway and follow the narrow path. That’s the shortest way.“ No sooner said than done. The second I walk towards the back of the old house, I know that something doesn’t add up – for whatever reason. Soon, I’ll find out. Within the private home, Sverri Steinhólm is about to pour home-made pancake batter into hot iron pans. “Welcome to Uppi í Beiti“, he says – loosely translated: welcome to a place that’s called “up at the pasture“; where the cows were grazing in the olden days. Uppi í Beiti, a turf house with walls made of giant rocks and wood, located in Viðareiði on the island Viðoy, the northernmost of the Faroes. A village (about 350 inhabitants) built on an isthmus, high mountains both to the north and the south, linked to the regional center Klaksvík by tunnels and a causeway. An old farmhouse? Too vague. Because it’s actually two houses we are in, one part dating back to 1890, the other to 1926. That’s the impression I got but couldn’t put into words when I walked towards the back of the house in the first place: slightly nonparallel floors and walls. And with that said, we are right in the middle of our story featuring Sverri and his wife Armgarð. Preserving culture, tradition and history: That’s what it’s all about. This summer, Sverri the pastor poured 200 liters of home-made pancake batter into his small iron pans. For guests, when Uppi í Beiti turned into a unique five-week-pop-up-café. That’s how Sverri spent his summer vacation. Running a café, collecting money, in order to be able to persistently restore the building(s), accurate in every detail. 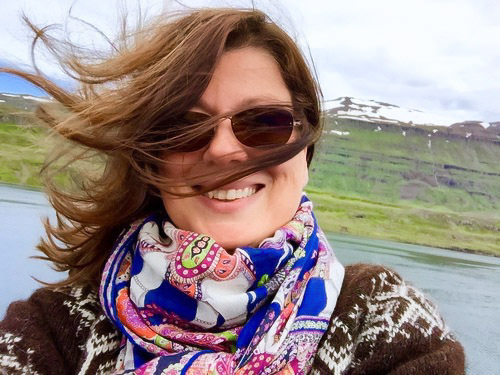 During the week, Armgarð is the head of the infrastructure department of Landsverk, the Faroese institution that consults, plans, carries out, runs and maintains main roads, harbors, buildings and helipads. 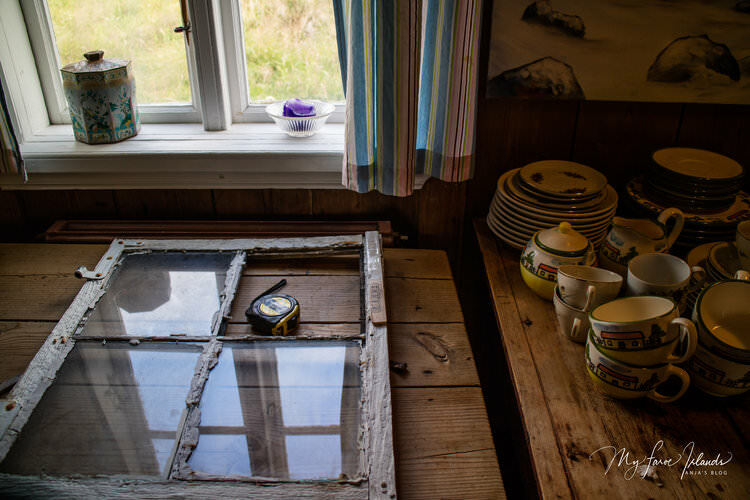 In her spare time, she carefully sands 128-year-old window frames. 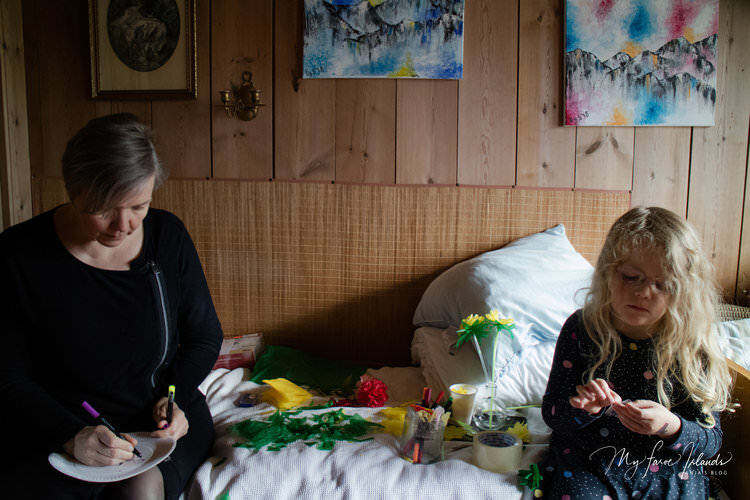 Tórshavn is their main residence, Uppi í Beiti their second home, the place Sverri and Armgarð want to live in one day, once they retire. Vestiges of the past everywhere. A dictionary of foreign words, published in September 1837. A 1869-bible. Also old ropes, tools, buoys and a bird-catching net in the former roykstova. 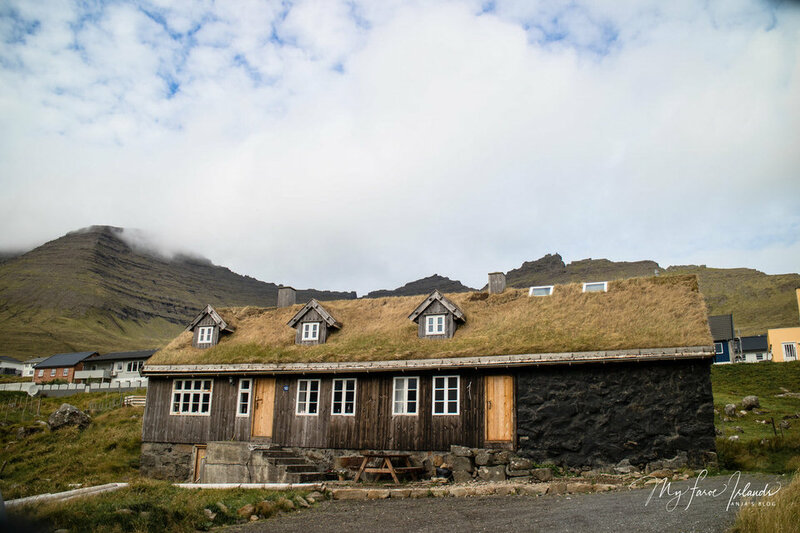 In olden days: the room without a ceiling board and with a smoke hole in the roof ridge; where the hearth (grúgva) was situated. Shortly after, we are sitting at table, having cake, whipped cream and delicious pancakes made by Sverri. 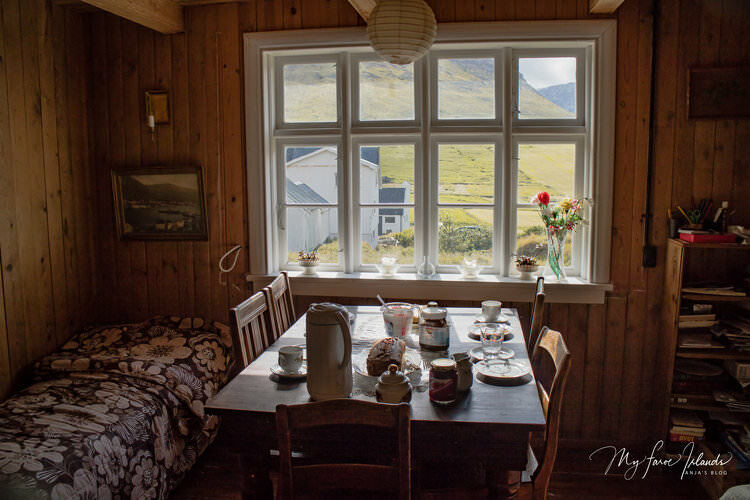 He grew up in Toftir on the island Eysturoy, with 6 sisters and 4 brothers. In the beginning, he worked as a fisherman and ship’s cook for many years – then he went back to high school and college in the mid-eighties, studied theology in Copenhagen and became a pastor of Fólkakirkjan, the Faroese Evangelical Lutheran Church. How come? “I’ve always been strongly rooted in faith. But then I had a car accident. Which meant three months in hospital. Broken legs, broken back. I had plenty of time to think. I decided that I wanted to do something meaningful, something that helps and serves others.“ Tórshavn cathedral, hospital, prison: As a pastor, Sverri meets „all those who are sorely in need.“ His additional mission in his free time: preserving Uppi í Beiti. The old farmhouse in Viðareiði that’s actually two houses. Before I leave, I’ll take a few more pictures. This time, in front of the house. As clear as day. Floors and walls: nonparallel. Two doors. And worthy of preservation. POP-UP CHRISTMAS CAFÉ: Sverri will have another pop-up café at Uppi í Beiti. This time, the house will turn into a cozy Christmas café. The dates are: 23 - 25 November. 30 November - 2 December. And 7 - 9 December. All days: open from 1 in the afternoon to 7 in the evening. Hot and cold beverages, pancakes, Christmas almond cream rice pudding, sweet biscuits and much more. Guests can also bake cookies. Details and booking via Uppi í Beiti on Facebook. The house is a private home and so far not available for vacation rental. All the same, companies or private persons willing to genuinely support the preservation work are welcome to contact Sverri via Uppi í Beiti Facebook.